No Theme Performance Festival 2017 ! No Theme Performance Festival: Fundraiser Carnival Edition! Cocoon Theatre's annual No Theme Performance Festival supports emerging artists by providing space for experimentation and collaboration in original work. It celebrates the uniquely intimate performance experience, and opens up the pathways of deeper community engagement. 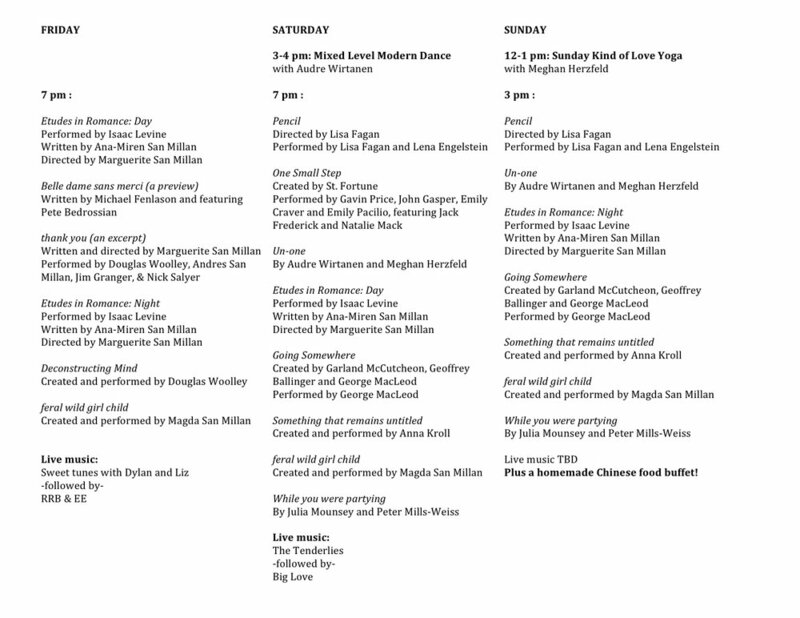 One weekend only, you will find dance, theater, live music, visual art, comedy, poetry, and maybe even something you didn’t expect – all in one place. This year our festival will be on September 1, 2 & 3 but we need your help before then! Help the Cocoon Theatre Carnival raise money for this year's No Theme, while enjoying a fun preview show. This fundraiser will be a night of food, performance, and a pop up shop of handmade goods for sale. Don’t miss our sideshows like the Yadda Yadda Twins, a Fortune Teller, a traveling singer/songwriter named Betty Ramble, a Singing Puppet, and a Feeble Bard. Plus a photobooth and portraitist! Join forces and have fun with us as we use a little art to make way for even more. Monday, July 31 at 7 pm. 9 Vassar Drive, Poughkeepsie. Admission $25. This brain image is from The USC Stevens Institute for Neuroimaging and Informatics. It reveals a dynamic architecture to that gelatinous organ that lies within our skull. As most people , artist Douglas Woolley has always had a fascination of what occurs and is occurring within that calcium dome. The Buddhist look for nirvana- the numinous moment where all is revealed, but to him the miraculous moment is now- this quotidian instant, the sense of “here” and of “still here” and of “will be here”. This work, through misdirection and obfuscation makes a tangential attempt to illuminate this irruption into the whatever, this bubble of a moment, this ever articulating, ever changing, ever present sense of consciousness. For those of you who haven't heard, No Theme is back! Click here to see our No Theme Gallery. What is No Theme you ask? The No Theme Performance Festival supports emerging artists by providing space for experimentation and collaboration in original work. It celebrates the uniquely intimate performance experience, and opens up the pathways of deeper community engagement. One weekend only, you will find dance, theater, live music, visual art, comedy, poetry, and maybe even something you didn’t expect – all in one place. We hope you join us! September 1&2 – 7pm, September 3 – 3pm. Help the Cocoon Theatre Carnival raise money for our 4th annual No Theme Performance Festival. A night of food, music, performance, and a pop up shop of handmade goods for sale. Don’t miss our sideshows like the Bearded One, the Yadda Yadda Twins, the Fortune Teller, and the Singing Puppet. Plus a photobooth and games for all ages. Join forces and have fun with us as we use a little art to make way for even more. Monday, July 31 at 7 pm. 9 Vassar Drive, Poughkeepsie. Admission $25. If you live far away and can’t make it to the fundraiser, you can still donate to our cause from the comfort of your own mediated interface! All contributions, however small, are helpful. We are a young festival, growing stronger every year. Since 2014, we have seen audiences expand, conversations with and between artists deepen, collaborations kick-off, and local excitement grow. Your gifts support festival expenses, and more importantly, getting the art here. We strongly believe artists deserve to be compensated, and with your help we can get there sooner rather than later. Donate now to help support our work. To put it simply, No Theme would not be possible without our incredibly dedicated and very small team. Volunteers work with crew members before, during, and after the festival. They can work the box office, help transform the space, host artists, cook, clean, deliver coffee, tell jokes, etc. What better way to get people talking than to get people talking? Tell your friends, email the cousins, share on facebook, spread the word! Pay at the door by cash, check, or credit card. Or CLICK HERE to buy online! ART: Join us for edibles, music and art on Saturday, October 29 at 2 pm. Free. 12 Vassar St. Cunneen-Hackett Theater. DRESS REHEARSAL: Monday, October 31 (Halloween) at 7 pm. $10. 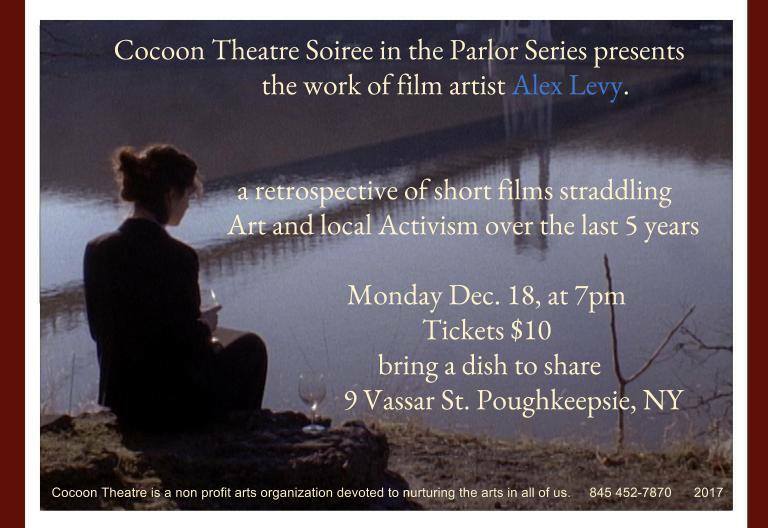 Join us for a Soiree in the Parlor sharing selected scenes from the upcoming Festival, with audience discussion. Potluck event, bring a dish and arrive costumed! Cocoon presents its third ‘Annual Beckett Performance Festival,’ sharing three short Beckett plays, performed by Cocoon Actor’s Theater. Not I is a haunting duet piece exploring the voice of one woman. It is considered a short dramatic monologue, although consisting of two characters, written in 1972 by Samuel Beckett, translated as Pas Moi; premiere at the "Samuel Beckett Festival" by the Repertory Theater of Lincoln Center, New York, directed by Alan Schneider, with Jessica Tandy and Henderson Forsythe. A Piece of a Monologue is a very quiet monologue for one male actor. It is a fifteen-minute play written by Samuel Beckett, between October 1977 and April 1979. It followed a request for a “play about death” by the actor David Warrilow who starred in the premiere in the Annex at La MaMa Experimental Theatre Club, New York on 14 December 1979. The Old Tune is a fast-paced, comedic duet for two very old men. It is a free translation of Robert Pinget’s 1960 play La Manivelle in which Samuel Beckett transformed Pinget’s Parisians, Toupin and Pommard into Dubliners, Cream and Gorman. Its first radio broadcast was by the BBC on 23 August 1960. Barbara Bray directed Jack MacGowran and Patrick Magee. Tickets: Pay at the door by cash, check or credit card. OR CLICK HERE to buy online! Special guest lecturers will speak post-show, with open discussions with the directors, actors, and audience. A visual art installation with music will be presented in the parlor rooms of the theater building before and after each performance. 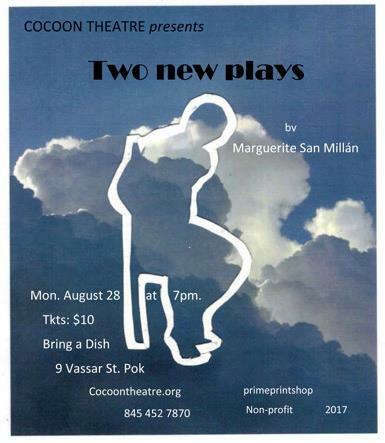 Cocoon Actor’s Theater is an ensemble of performers working throughout the year together on various classic material, sharing roles and duties. Jim Granger, Andrés and Marguerite San Millán, and Douglas Woolley. Samuel Barclay Beckett (13 April 1906 – 22 December 1989) was an Irish avant-garde novelist, playwright, theatre director, and poet, who lived in Paris for most of his adult life and wrote in both English and French. He is widely regarded as among the most influential writers of the 20th century. Beckett's work offers a bleak, tragicomic outlook on human existence, often coupled with black comedy and gallows humour, and became increasingly minimalist in his later career. He is considered one of the last modernist writers, and one of the key figures in what Martin Esslin called the "Theatre of the Absurd". Beckett was awarded the 1969 Nobel Prize in Literature "for his writing, which—in new forms for the novel and drama—in the destitution of modern man acquires its elevation."